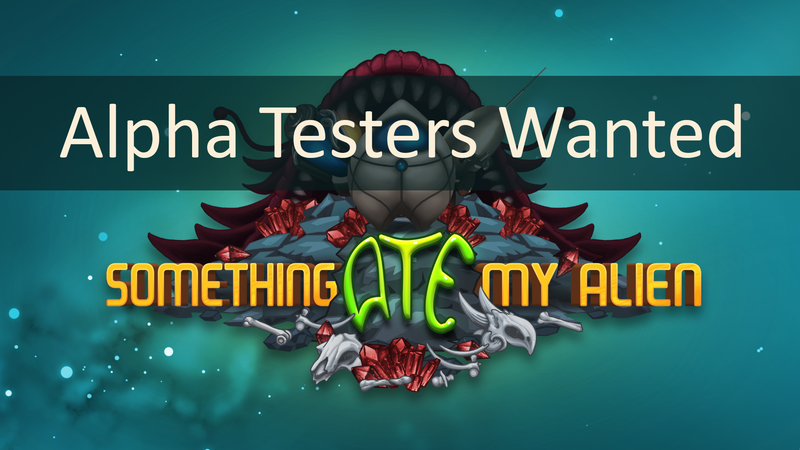 We are currently looking for Alpha testers for our game "Something Ate My Alien". This is a limited access event, so it will be based on a first come, first served basis. Currently, we are testing the Windows PC version of the game. We also plan to test under Linux soon. If you wish to join the Alpha testing, please read below thoroughly, and then join the forums by clicking here and then send an email to info@rokabiumgames.com to say you 'agree and understand' the rules. Once we receive your email, you will be added to the Alpha Test forums and sent a download link and instructions. Firstly, this is an Alpha test. This means that there could be bugs and problems with the game, although we currently believe it is in a stable and good state. Some features and things have not yet been completed, so this is not the final game. *** If you participate in the Alpha test, you must safeguard and prevent unauthorized access to, copying, disclosure, and unauthorized use of the game to the best of your ability. The Alpha Key lasts for 30 days from the date you receive it, but just email us again if it expires and you want to continue testing the game and we can extend that. What we are looking for is any bugs or problems you find, and also what you think of the actual game play. Is it interesting and fun to play? Too easy? Too hard?... etc. So you are aware, in Alpha mode the game is sending back info to our server from your PC. Apart from your IP, there is no personal info being logged. It is only technical data about the game and Unity that we need to try to find bugs and problems with. This includes error messages from the game, your PC spec, FPS rates, screen sizes, progress in the game etc. By downloading and playing the game you are agreeing to this. This data will not be published or given to any other party, and is used solely to help with us finding problems with this game "Something Ate My Alien". You are free to share any screenshots, video captures or info about the game. Thanks for taking time to participate in this Alpha test, and hopefully you have fun playing our game. Welcome to the SAMA forums. We would love to hear any feedback and what you think of the game so far. As the game hasn't been released yet and is in dev phase, this forum is not active. Once we are further along, this is where you can post and tell us about any problems you might have with the game.